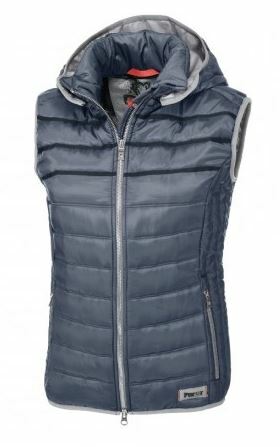 A sporty lightweight womens waistcoat by Pikeur which is quilted and features a deatchable hood. 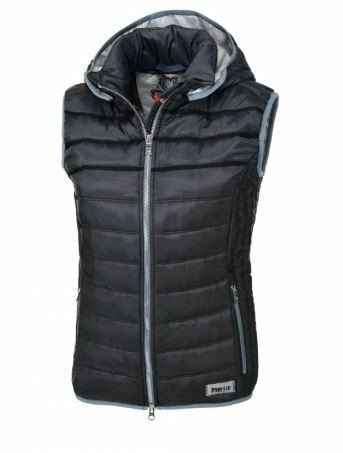 The ideal gilet for Sping/Summer whether you are out riding or even walking the dog. 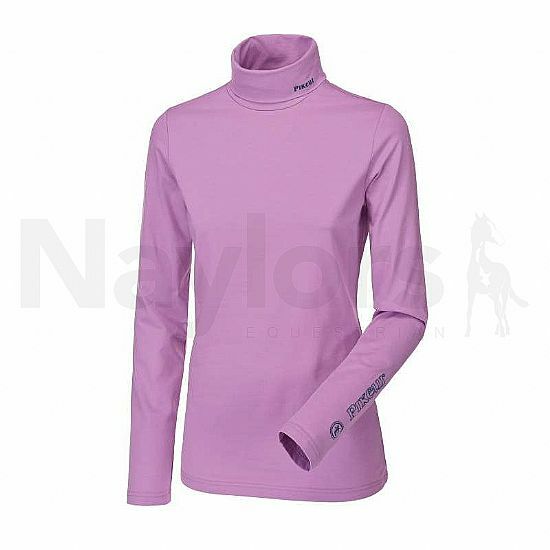 Fashionable and functional ladies competition shirt with 1/2 sleeves and white stand-up collar. Aquina smart ladies` jacket with stand-up collar. Bi-elastic, wind and water-repellent material. Also brushed on the inside. Pearl band application on collar and softshell flap at collar with popper and PIKEUR labelling with stud application. Material: 100% polyester. Functional fabric. 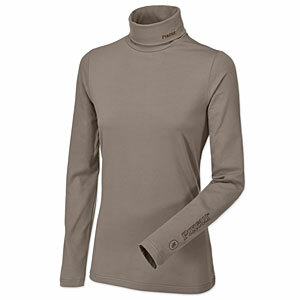 Very light, super elastic and breathable, slim, close-cut fit, also with narrower sleeve. Collar of subtly embossed fabric. Edged with new press studs and zip fastening.Zip pockets.Metal PIKEUR plaque on sleeve. Rear slits with shiny braid. 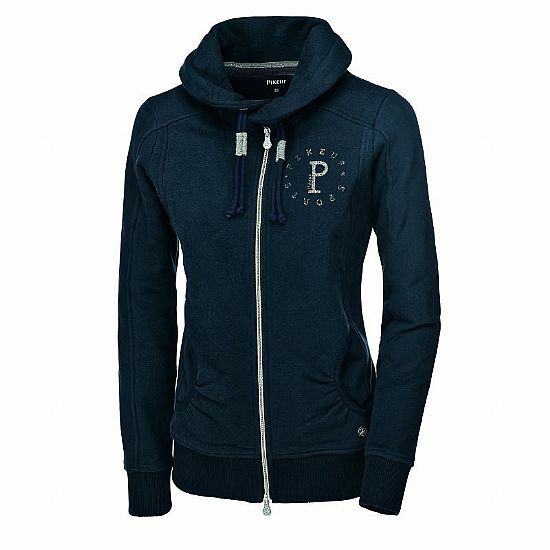 Fashionable ladies sweat jacket with stand-up collar and adjustable hood. The hood is equipped with cordband. With tone-on-tone overlock seam application at the front and hind body as well as at the sleeves. With knitted cuff at the seam and at the sleeves. With front kangaroo-pockets with zips and 2-way-zip. 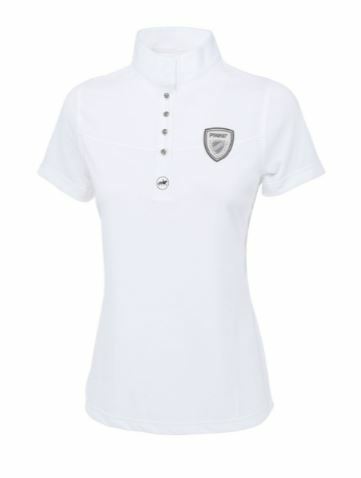 With Pikeur-embroidery at the back of the collar and at the seam. Material: 50% cotton, 50% polyester. 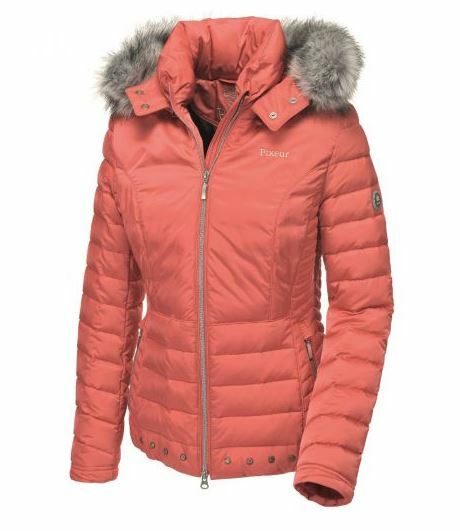 The Pikeur Ladies Premium Palmira Down Jacket in Coral is assured to be particularly popular this autumn / winter period. Stand out in a beautiful coral colour, this deluxe jacket features 80% down and 20% feather filling* for ultimate warmth and comfort in the cold and windy weather. With a faux fur trimmed hood, low sitting hem, snug style and elastic lattice, this jacket is a truly timeless piece that will be wearable through many winters to come. The front zip pockets are perfect hand warmers or a place to keep your valuables. 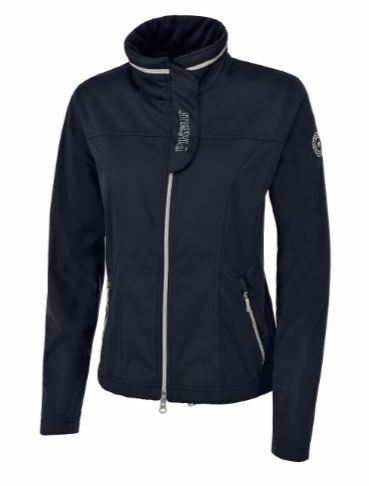 The Palmira jacket is a true frontrunner in luxury, elegance and practicality. The Philippa is a stylish parka filled with 80% down and 20% feathers. 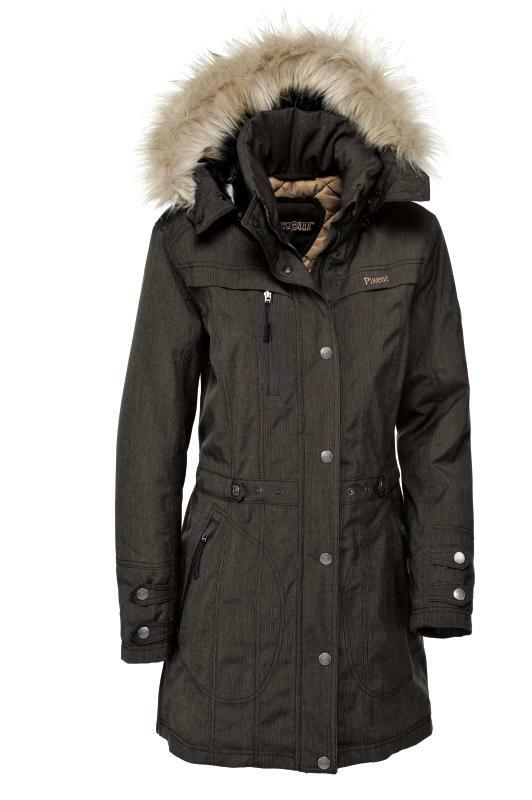 Therefore the parka is warm, lightweight, supple and insulating. 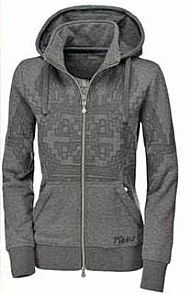 The Philippa has a detachable hood with faux-fur trim and trendy lining. The faux-fur trim is also detachable. The slightly shiny and quilted outer fabric gives the parka a luxurious look. The parka has two zippered pockets, a two-way zipper, wind cuffs at the ends of the sleeves and two inside zip pockets. 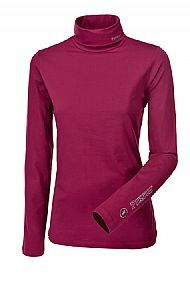 On the left chest, the back of the collar and on left sleeve is a Pikeur logo. At the bottom trendy finished with small Pikeur logos. 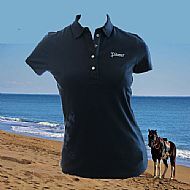 Equipped with riding slits with zipper at the sides. Machine washable. The Pikeur Ladies Sina Polo neck Pullover is a soft and warm cotton fabric with elastane for stretch and freedom of movement, an ideal garment for a layering system. The Sina Polo neck washes well and keeps its shape. 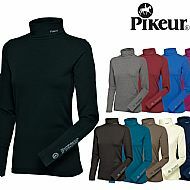 The Pikeur logo is featured on the collar and on sleeve. 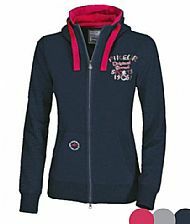 Trendy ladies sweat jacket with fashionable high scarf collar. The collar is equipped with poppers and doublecord-band. With knitted fabric at the gathered side pockets, at the sleeves and at the seam. With quilted elbow-patches. With 2-way-zip. 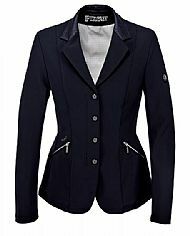 With Pikeur-crystal-studs-labelling at front and at the back. 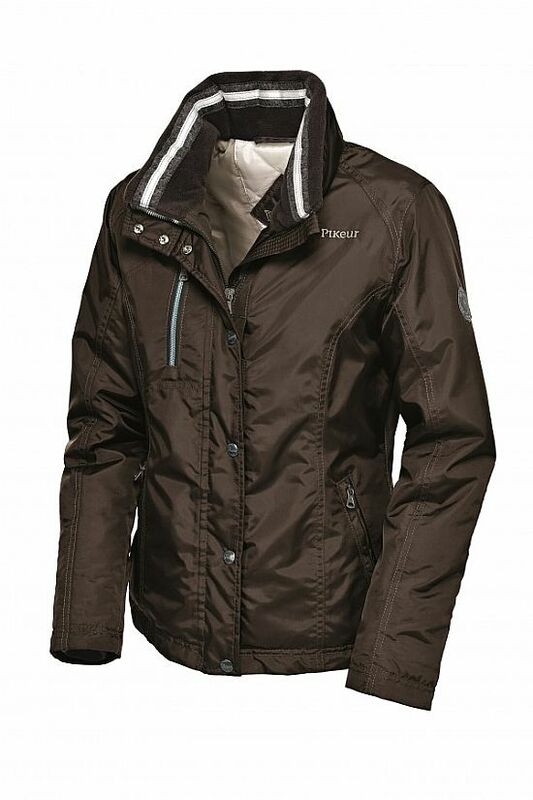 Windproof, waterproof parka with fully taped seams and knitted wind stop in the sleeve. Featuring fur trimmed detachable hood, synthetic leather detail to the collar edge, 145g wad quilted inner lining, adjustable waist tunnel and waterproof-zip slant pockets. Finished with chest flap pockets, half-sleeve patches in synthetic leather, zippered side slits and decorative poppered flaps to the sleeve. Fashionable ladies sweat jacket with attached hood. The hood is lined in contrast color and is equipped with contrast-band at the outside. 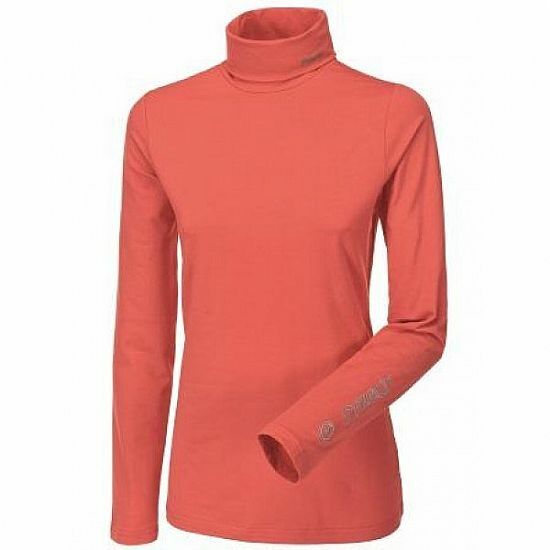 With knitted fabric at the sleeves and the seam. With side pockets. With fashionable Pikeur-labelling made with sequin and perls at the left chest and Pikeur-Icon with sequin-application on the right pocket. A pretty and feminine polo shirt from Pikeur in soft cotton. Four stone buttons and Pikeur sign in small stones on left chest. Print of flowers in a lighter colour at the bottom right side. 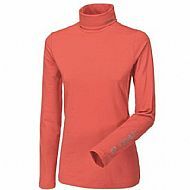 This polo neck from Pikeur is made from a soft and warm cotton/elastane blend that gives great movement and makes this a perfect top for layering. The top if finished with Pikeur logo branding to the collar and sleeve. Made from 94% cotton 6% elastane. The Pikeur Aldina Fleece in light grey or raspberry, lovely soft fleece material with a high collar with a wide woven cord. It has a knitted band on the hem and cuff and Metal PIKEUR label on left sleeve. There is a pretty heart shaped strass motif on the back of the neck. Designed with a beautifully soft outer fabric and featuring a plush inside it offers superior comfort and warmth throughout wear. 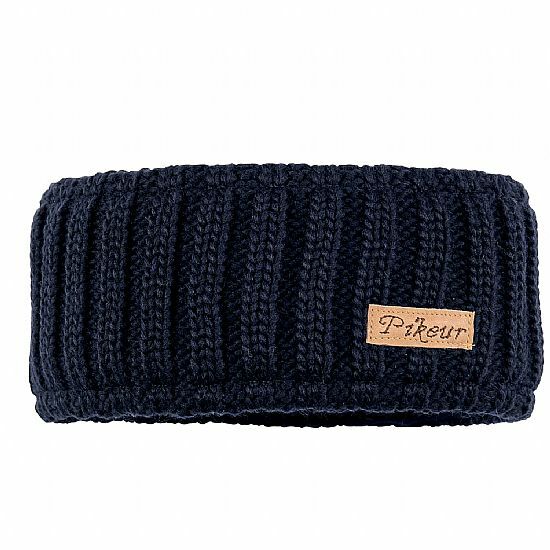 The flattering cut provides you with a stylish and feminine appearance making this a must have item. The attached hood displays stunning strass detailing for a beautiful, eye catching design. Added features include sleeve patches with a quilted contrast yarn, an adjustable lower waistband for a perfect fit, a two way front zip and two zippered hand pockets for a practical finish. Designed with a sporty, rip-stop outer fabric that features a beautiful shimmer effect it provides a unique style and practicalities. The 165g wadded quilting ensures optimum insulation is achieved throughout wear keeping you suitably warm through the cool winter months. 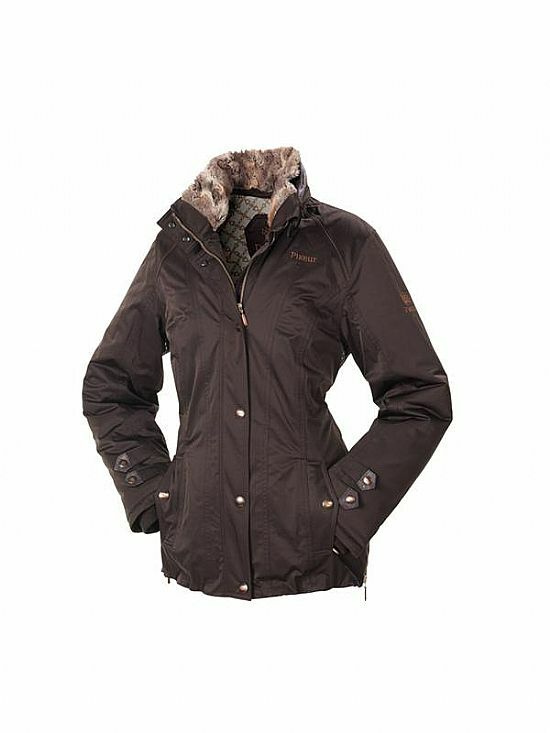 Superb functional features include a removable hood for protection from the elements, a concave cord on the hood and a stand up collar for added warmth. Finished with decorative stripes at the pockets and zip edge along with poppers and studs to match the fabric! 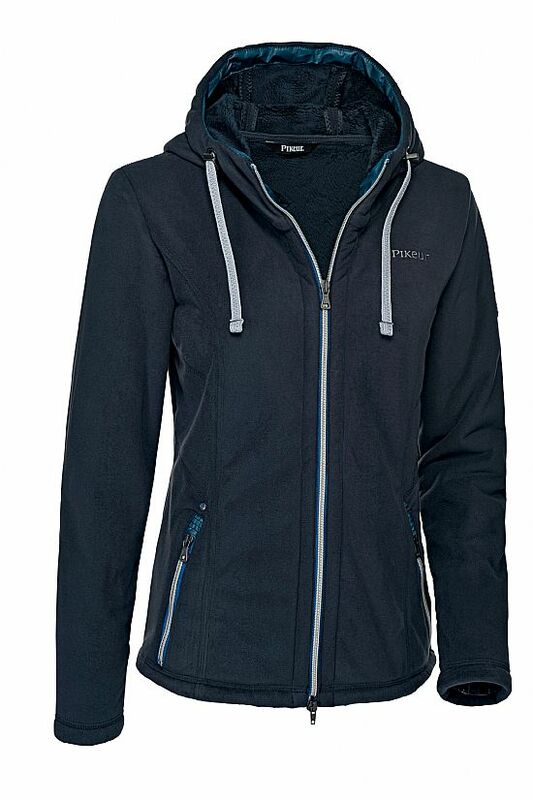 Beautiful softshell jacket in high quality soft fabric with snug fleece to the reverse. Featuring detachable hood, concave hood cord, contrast hood lining, and narrow felt strip and ribbed band to the inner hood edge. Finished with decorative zip details, small zip pocket, contrast bordered seams, contrast patches and roller band borders to the seams. 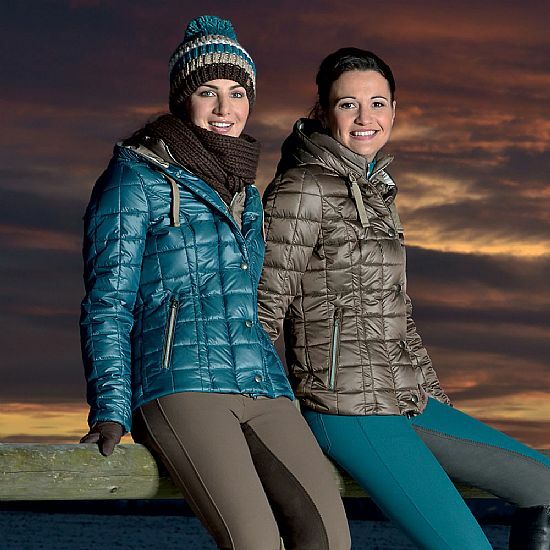 Pikeur always style beautifully, making a practical jacket flattering and comfortable to wear. The Juana is waterproof with taped seams with a two way zip, zipped slant pockets and a zipped phone pocket to right chest. The logo press studs have just a hint of turquoise on the antique brass finish which is echoed in the phone zip - just a hint of that contrast colour. It has a fixed hood which can tuck away into the collar and the collar is fleece lined for cosiness. 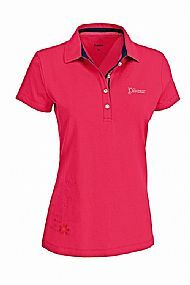 There is a lovely contrast detail to the elbow area and has an attractive embroidered badge to left sleeve. 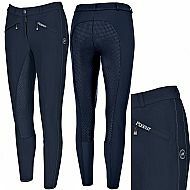 The Pikeur Dakona Grip Ladies Breeches are elaborate 4-pocket breeches with studs and zip applications as well as � Grip-PU finish in seat insert area. Perfect fit due to medium waist height and new stretch insert integrated on the inside at ankle. Riding breeches with optical high band, McCrown seat and jeans pockets. The front closure is provided with three slide buttons. 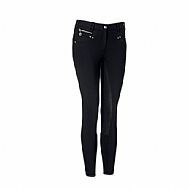 The large belt loops make these riding breeches extra trendy. 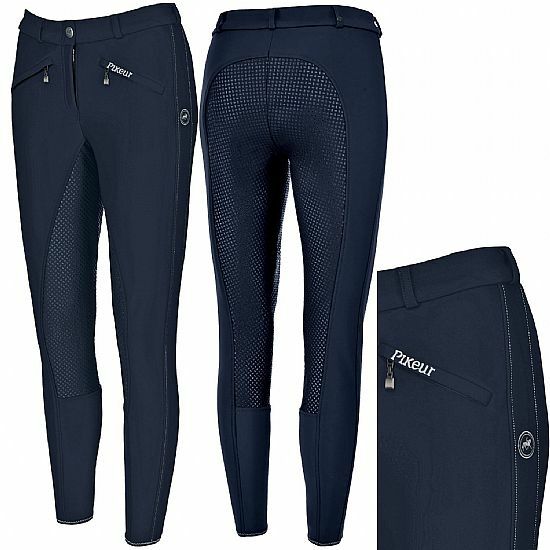 The riding breeches has velcro around the ankles. The riding breeches falls just over the hip. 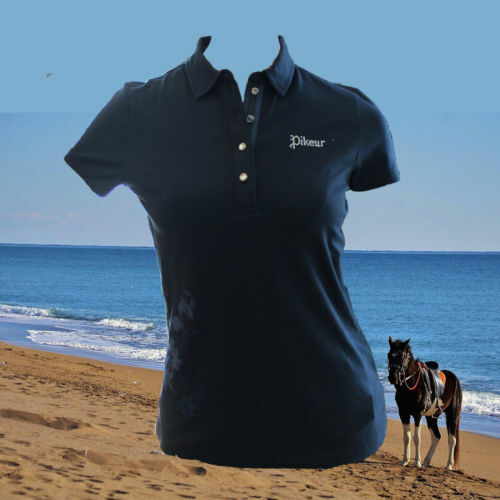 Made of Prestige-Micro fabric, this material is composed of 64% cotton, 29% polyamide and 7% spandex and therefore comfortable in all seasons. Machine washable. Available in the colour cream. 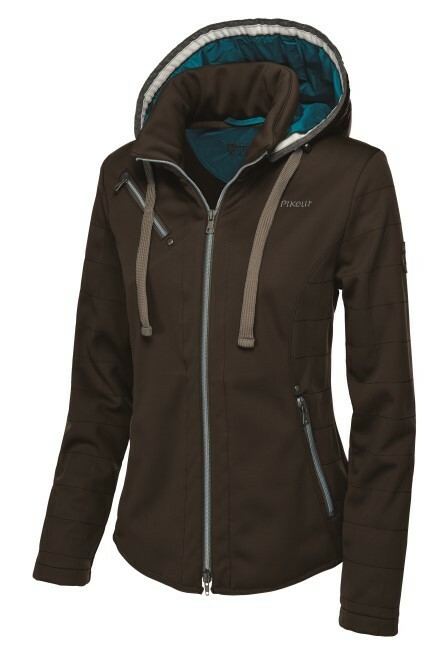 In a shimmer finish, this classic wind and waterproof jacket features durable taped seams, Primaloft� lining sections and integrated hood. Contrast outer collar, removable fur collar and elasticated waist tunnel with popper flap. 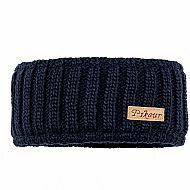 Finished with knitted wind stop in the sleeve, premium embroidery and emblem details.